A few days ago I had lunch at the Jardin du Mas in Biot. Although it’s not even 2 minutes from my house, I still hadn’t been there so I was very happy when my friend decided to organise her birthday lunch there. It was 17 degrees and the sun was shining so we sat outside by the pool overlooking the Chèvre d’or. The food and service was great! We shared a platter with oven roasted camembert with black truffles for entrées, then I had risotto with gambas. I can definitely recommend this place! For the third time we had the honour of catering for our client at the Private Jet lounge at Nice airport for the Monaco Yacht Show. During 5 days we served fresh smoothies prepared from our smoothie bar, as well as Champagne, drinks and canapés for guests either departing our arriving with their private jets. We had savoury canapés such as Vitello Tonnato spoons, mini lobster rolls with smoked chili flakes, mini caramelised onion tarte with jerusalem artichoke crisp, burrata mousse with pearl tomato and crispy fried basil and also sweet canapés such as verrine with passionfruit cheesecake, mini raspberry tarte tropézienne, lemon and coconut cake pops, chocolate fudge tarte with camargue sea salt, raspberry tartlets etc etc. Very fun and different work place for 5 days! Wishing you all a Merry Christmas with some of the photos from the event we just did in London for a client. It was the second year in a row where we had the honor to cater a typical Swedish Christmas Dinner party. For canapés, we made lobster cappuccino with “glögg” foam and piment d’espelette, reindeer wraps with horseradish cream and Swedish “Prästost” cheese cake pops with Swedish Mackmyra Whisky and dried lingonberries. All this whilst having “Glögg” and Swedish cocktails. The dinner was divided into three traditional Swedish Christmas buffets; one with all cold classic starters, herrings, salmons, stuffed eggs with bleak roe, seafood salad, mini “Västerbotten” cheese pies etc then a warm buffet with all warm dishes such as “Jansons”, glazed ribs, Christmas ham, meatballs, caramelised red cabbage etc then finally a dessert buffet where we had made “Ris à la malta”, lemon fudge, Christmas butterscotch, chocolate truffles, gingerbread etc. Happy Holidays from La Bonne Chère! A little while ago we catered for a party on the key at the Cannes Yacht Show hosted by a luxury yacht company. Around 200 guests enjoyed canapés such as mini filo pastry parcels with peking duck and baby cucumber, verrine with burrata mousse, pearl tomatoes and fried basil, mini lobster rolls, smoked salmon roll with wasabi cream cheese and sesame seeds, mini wraps with Black Angus beef & truffle and spoon with Salma salmon sashimi with Asian crisp salad. Then a selection of our sweet canapés. All this while sipping Möet & Chandon and cocktails, passing by the caviar bar and enjoying the beautiful view overlooking the old part of Cannes. Another wedding brunch we did was in Roquebrune-Cap-Martin with the most stunning view overlooking Monaco. It turned out that it was in the exact same villa we had organised a wedding a year ago, so we were well familiar with the venue. We organised a typical Italian buffet the night before the wedding, then a classic brunch with an Italian touch on the Sunday the day after the wedding. The guests enjoyed mini bloody mary’s, Ceasar salad, mini bruschettas, mini chicken and bacon club sandwiches, rocket salad with crema di Balsamico, brie cheese tarte with chili & caramel nut crunch, fresh fruit platters and a selection of mini desserts. We have just finished our far most busy autumn ever. It has literally been non-stop with weddings, lunches, cocktail parties and dinners since this summer. One event we did at the end of the summer was this beautiful wedding brunch for a Swedish/French couple at a fantastic private beach in Monaco. The restaurant had prepared typical mediterranean dishes while we had prepared classic Swedish dishes such as shots of seafood salad and crispy filo parcels with Swedish Västerbotten cheese when the guests arrived, and then on the brunch buffet, a selection of Swedish classic dishes such as; mini prawn sandwich with dill and lemon mayonnaise, hot smoked salmon, elderberry cured Gravlax salmon, Herring cake, mini Jansons frestelse gratin, classic meatballs with beetroot salad and stuffed eggs with bleak roe. 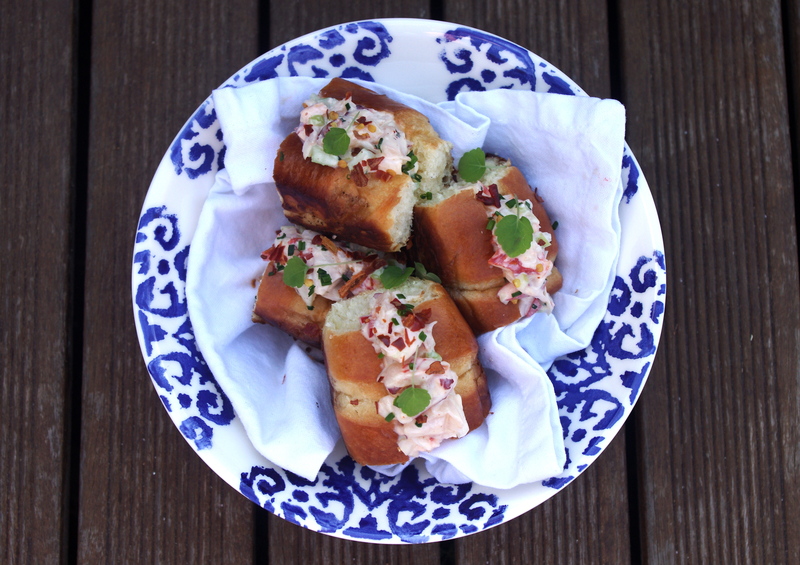 I absolutely fell in love with these lobster rolls last time I was in New York. The best ones were without a doubt at the Chelsea market. You could serve them as a main course, on a buffet or as I did this time, for apéritif with a glass of ice-cold Champagne. 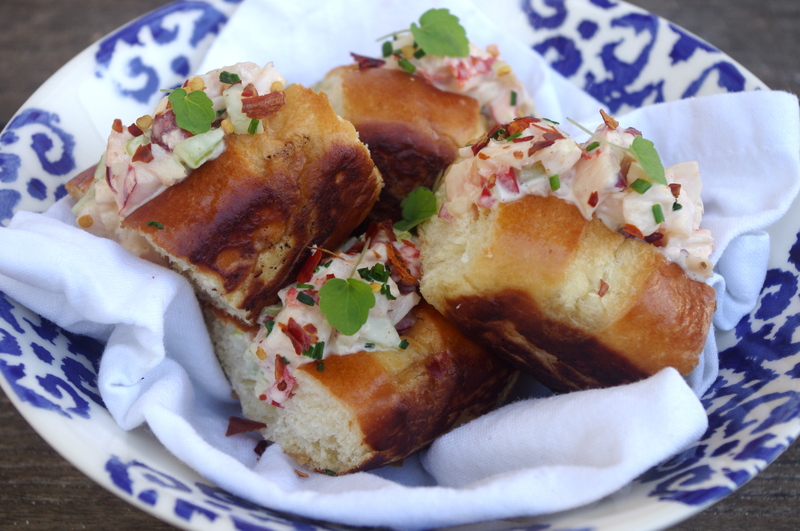 In the original recipe there’s only lobster, mayonnaise, celery and cayenne pepper and but I decided to spice my rolls up a little bit and added red peppers, some onions, some crème fraiche and piment d’espelette instead of cayenne pepper. Simply divine! Bring water to a boil in a big pot and salt generously. Add the lobster, cover, and cook until bright red, around 8 minutes. Let the lobster cool on a tray. Crack the lobster shell, pick meat from tail and claws, and cut into chunky pieces. Mix lobster, mayonnaise, crème fraiche, chopped celery, onion and peppers along with the lemon juice, chives, and piment d’espelette. Season with salt. Leave the mixture in the fridge for an hour or two to really boost the flavours. Heat a large pan and fry the sides of the buns in butter. Cook until golden, about 30 seconds per side. 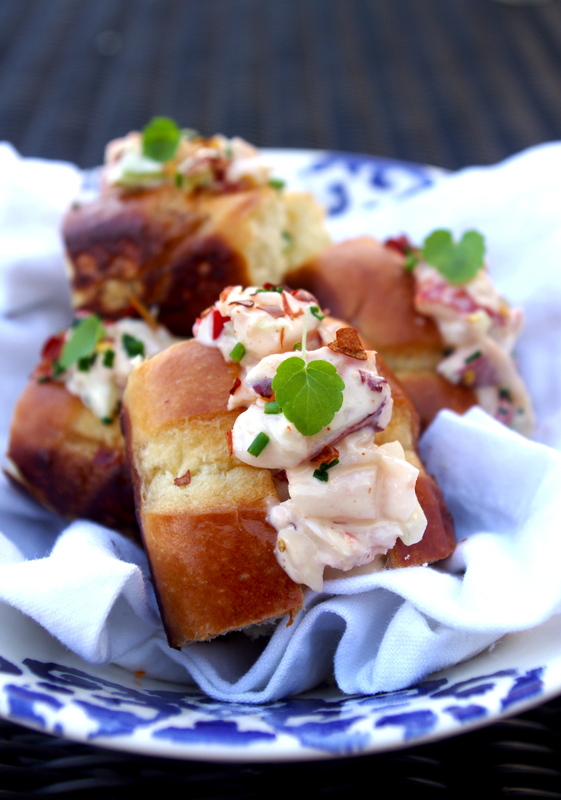 Take them of the pan, make a large cut on the top of the bun, cut them in half (for minis) and fill them with lobster mixture. Decorate with some extra chives.